It’s nice to know what other bloggers are saying about Blog Engage before you decide to jump in and spend your hard earned money. I’m going to share with you, some of the posts other popular bloggers wrote and after reading them you can make the decision to join, or not to join our blogging community. The first post I invite you to read was a fantastic article named “50 Experts Reveal How to Promote Your Blog with Just 3 Tools” In the article Blog Engage was placed top 7 recommend from bloggers within the blogosphere. I was extremely happy to see our blog community listed within that post. The second article I would like to share was written by Ms Ileane from Basic Blog Tips. She mentioned us as an option for YouTube Syndication amongst other recommendations. Her article titled “Need a New Way to Promote Your YouTube Channel? Try RSS Syndication” shares ways to distribute your YouTube content, she was very nice to add Blog Engage into this list of suggestions. The third article I’d like to share was from Kiesha at We Blog Better. Her article named “How to Connect with Bloggers: The Best Place to Start” mentions Blog Engage and how it’s played a key role in her success online. Kiesha is an amazing person and I’m honored she had taken the time to mention us in a solo post on her blog. The fourth article I’d like to share was from Justin at Dragon Blogger. Blog Engage recently launched YouTube Syndication and Justin’s post demonstrates the value and benefit from the program. His latest post titled “The All New Blog Engage with YouTube Syndication” is a real winner in my books. Justin always takes the time to write really informative posts and I truly appreciate the hard work he puts into them. The fifth post I’d like to share is from Winson Yeung. His post discusses the Blog Engage system and it’s affiliate program. He’s been a Blog Engage member for sometime and is very familiar with the community. His post named “Top Blogger Network With RSS Syndication Services” Make sure to visit ti and have a peak, it’s a great post from a great blogger. The sixth post is from Jason Mathes, he’s a dedicated Blog Engage member and wrote a smashing post titled “An In-Depth Look into Blog Engage“. He has gone and added screenshots demonstrating the true value and benefit of our blog community. Have a peak at this great post and learn how to use some of Blog Engage features. Our seventh post is from Thejas Kamath and his detailed Blog Engage post demonstrates all our features and benefits. He’s discussed or Affiliate network and Blog Engage community. The post titled “The Best Blogging Community For Bloggers“. Similar to some of the posts it needs image updates but I’m sure the members will get to that ASAP. Our eighth article is a real great post with a ton of detailed Blog Engage information. Abid Omar wrote “Blog Engage Review : Best Online Community for Bloggers” and this review is the real deal! I encourage all our visitors or anyone considering using the service to visit this post and read up on our services. The ninth article is not only about Blog Engage but we were named the #1 one blog community to join for bloggers. The article titled “7 blogging communities to promote your blog” includes Blog Engage as it’s first suggestion when it comes to blog communities. This article puts Blog Engage above all the rest including sites like BizSugar, BloKube and more. The tenth post is written by none the less than Zac Johnson. His post named “RSS Syndication and Growing Your Blog with Blog Engage” tells a great story of how Zac used the Blog Engage system to create a popular blog online. Follow in Zac’s footprints and sign up to Blog Engage as he suggests. Over time I will be adding more articles to this list! 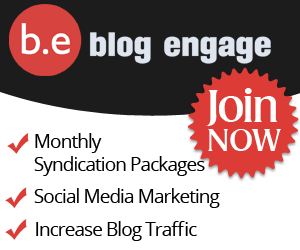 Blog Engage is an amazing community and I work hard to ensure all our members feel welcome and see an increase of blog traffic. I hope the following posts encourage you to join our community, make sure to engage with us, add me as a friend and connect! Blogengage is a superb community which helps blogger to get more relevant referral traffic. It is really exciting to see all the articles are already published about Blogengage! I am a regular viewer of Blog Engage community. It contains list of top blogs on various niche. I think it is the best blogging community I have ever visited. Blogengage is a good community of bloggers, and in my experience, I have seen everyone helps each other even with small things they have to offer. Even I have started helping fellow bloggers with my limited knowledge and it feels great.